Romantic music or music in the Romantic Period is a musicological and artistic term referring to a particular period, theory, compositional practice, and canon in European music history, from about 1800 to 1910. Romantic music as a movement evolved from the formats, genres and musical ideas established in earlier periods, such as the classical period, and went further in the name of expression and syncretism of different art-forms with music. Romanticism does not necessarily refer to romantic love, though that theme was prevalent in many works composed during this time period, both in literature, painting or music. Romanticism followed a path that led to the expansion of formal structures for a composition set down or at least created in their general outlines in earlier periods, and the end-result is that the pieces are 'understood' to be more passionate and expressive, both by 19th century and today's audiences. Because of the expansion of form (those elements pertaining to form, key, instrumentation and the like) within a typical composition, and the growing idiosyncrasies and expressivity of the new composers from the new century, it thus became easier to identify an artist based on his work or style. Romantic music attempted to increase emotional expression and power to describe deeper truths or human feelings, while preserving but in many cases extending the formal structures from the classical period, in others, creating new forms that were deemed better suited to the new subject matter. The subject matter in the new music was now not only purely abstract, but also frequently drawn from other art-form sources such as literature, or history (historical figures) or Nature itself. Composers of the Romantic period sought to fuse the large structural harmonic planning demonstrated by earlier masters such as Haydn and Mozart with further chromatic innovations, in order to achieve greater fluidity and contrast, and to meet the needs of longer works or serve the expression that struggled to emerge. Chromaticism grew more varied, as did dissonances and their resolution. Composers modulated to increasingly remote keys, and their music often prepared the listener less for these modulations than the music of the classical era. The properties of the diminished seventh and related chords, which facilitate modulation to many keys, were also extensively exploited. Composers such as Beethoven, and later Richard Wagner, expanded the harmonic language with previously-unused chords, or innovative chord progressions. Some composers analogized music to poetry and its rhapsodic and narrative structures, while creating a more systematic basis for the composing and performing of concert music. Previous practices, such as the sonata form, continued in use, and composers extended them. [vague] There was an increasing focus on melodies and themes, as well as an explosion in the composition of songs, in particular lieder. The greater harmonic elusiveness and fluidity, the longer melodies, poesis as the basis of expression, and the use of literary inspirations were all present prior to this period. However, some composers of the Romantic period adopted them as the central pursuit of music itself. Composers were also influenced by technological advances, including an increase in the range and power of the piano and the improved chromatic abilities and greater projection of the instruments of the symphony orchestra. During the 1830s, Hector Berlioz's Symphonie Fantastique, which was presented with an extensive program text, caused many critics and academics to rise against the new music, in fact against Romanticism that had been a rising wave of artistic expression since the beginning of the century. Examples of music inspired by literary / artistic sources include Liszt's Faust Symphony, Dante Symphony, his symphonic poems and his Annees de Pelerinage, Tchaikovsky's Manfred Symphony, Mahler's First Symphony , the piano cycles of Robert Schumann and the tone poems of Richard Strauss. Schubert included material from his lieder in some of his extended works, and others, such as Liszt, transcribed opera arias and songs for solo instrumental performance. Events and changes that happen in society such as ideas, attitudes, discoveries, inventions, and historical events always affect music. For example, the Industrial Revolution was in full effect by the late eighteenth early nineteenth centuries. This event had a very profound effect on music: there were major improvements in the mechanical valves, and keys that most woodwinds and brass instruments depend on. The new and innovative instruments could be played with more ease and they were more reliable. The new instruments often had a bigger, fuller, better-tuned sound. Orchestras grew larger from the days of Beethoven onwards, and were on their way to professionalization . Another development that had an effect on music was the rise of the middle class. Composers before this period lived on the patronage of the aristocracy (Schmidt-Jones 3). Many times their audience was small, composed mostly of the upper class and individuals who were knowledgeable about music (Schmidt-Jones & Jones 2004, 3). The Romantic composers, on the other hand, often wrote for public concerts and festivals, with large audiences of paying customers, who had not necessarily had any music lessons (Schmidt-Jones & Jones 2004, 3). Composers of the Romantic Era, like Elgar, showed the world that there should be "no segregation of musical tastes" (Young 1967, 525) and that the "purpose was to write music that was to be heard" . In opera, the forms for individual numbers that had been established in classical and baroque opera were more loosely used. By the time Wagner's operas were performed, arias, choruses, recitatives and ensemble pieces often cannot easily be distinguished from each other in the continuous, through-composed music. Towards the end of the Romantic period, verismo opera became popular, particularly in Italy. It depicted realistic, rather than historical or mythological, subjects. The increasing importance of nationalism as a political and cultural force in the 19th century was mirrored in music and the other arts. Many composers expressed their nationalism by incorporating elements unique to their native cultures, such as folk song, dances, and legendary histories. In addition to these exterior elements, there was an increasing diversification of musical language, as composers used elements of rhythm, melody, and modality characteristic of their respective nations. Many composers wrote nationalist music, especially towards the middle and end of the 19th century. Mikhail Glinka's operas, for example, are on specifically Russian subjects, while Bedřich Smetana and Antonín Dvořák both used rhythms and themes from Czech folk dances and songs. Late in the 19th century, Jean Sibelius wrote music based on the Finnish epic, the Kalevala, and his piece 'Finlandia' became a symbol of Finnish nationalism. Frederic Chopin wrote in forms such as the polonaise and mazurka which were derived from Polish folk music. Many Russian composers, for example Balakirev, Cui, Borodin, Mussorgsky, Rimsky-Korsakov, and later Nikolai Medtner shared the common dream to write music that was inspired by Russian folk music. A freedom in form and design; a more intense personal expression of emotion in which fantasy, imagination and a quest for adventure play an important part. Emphasis on lyrical, songlike melodies; adventurous modulation; richer harmonies, often chromatic, with striking use of discords. Greater sense of ambiguity: especially in tonality or harmonic function, but also in rhythm or meter. Denser, weightier textures with bold dramatic contrasts, exploring a wider range of pitch, dynamics and tone-colours. Expansion of the orchestra, sometimes to gigantic proportions; the invention of the valve system leads to development of the brass section whose weight and power often dominate the texture. Rich variety of types of piece, ranging from songs and fairly short piano pieces to huge musical canvasses with lengthy time-span structures with spectacular, dramatic, and dynamic climaxes. Closer links with other arts lead to a keener interest in programme music (programme symphony, symphonic poem, concert overture). Shape and unity brought to lengthy works by use of recurring themes (sometimes transformed/developed): idée fixe (Berlioz), thematic transformations (Liszt), Leitmotif (Wagner), motto theme. Greater technical virtuosity – especially from pianists, violinists and flautists. Manuscript sketch for Piano Sonata No. 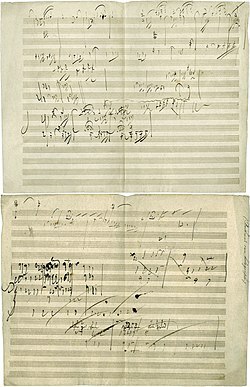 28, Movement IV, Geschwind, doch nicht zu sehr und mit Entschlossenheit (Allegro), in Ludwig van Beethoven's handwriting. Composed in 1816, this is the first piano sonata from Beethoven's late period. Beethoven's First Symphony and especially his fourth piano sonata, all published in the early 1800's marked a definite beginning of the new wave of music that would continue for at least a century. Beethoven's impact influenced and inspired composers in the following generations such as his fellow Vienna citizen - Schubert, Berlioz, Mendelssohn, Bruckner, Liszt and Wagner. By the second decade of the 19th century, the shift towards new sources of musical inspiration, along with an increasing chromaticism in melody and more expressive harmony, became a palpable stylistic shift. A new generation of composers emerged in post-Napoleonic Europe, among whom were Beethoven, Ludwig Spohr, E.T.A. Hoffmann, Carl Maria von Weber and Franz Schubert. These composers grew up amidst the dramatic expansion of public concert life during the late 18th and early 19th centuries, which partly shaped their subsequent styles and expectations. Works of this group of early Romantics include the song cycles and later symphonies of Franz Schubert, and the operas of Weber, particularly Oberon, Der Freischütz and Euryanthe. Schubert's work found limited contemporary audiences, and only gradually had a wider impact. Early Romantic composers of a slightly later generation included Franz Liszt, Felix Mendelssohn, Frédéric Chopin, and Hector Berlioz. All were born in the 19th century, and produced works of lasting value early in their careers. Mendelssohn was particularly precocious, and wrote two string quartets, a string octet, and orchestral music before even leaving his teens. Chopin was similarly precocious, his famous Op. 10 Études being written while still a teen, although he focused on compositions for the piano. Berlioz broke new ground in his orchestration, and with his programatic symphonies Symphonie Fantastique and Harold in Italy, the latter based on Byron's Childe Harold's Pilgrimage. What is now labelled "Romantic Opera" became established at around this time, with a strong connection between Paris and northern Italy. The work of Bellini and Donizetti was immensely popular at this time. Virtuoso concerts (or "recitals," as they were called by Franz Liszt[cite this quote]) remained as popular as a century earlier and became more 'democratic'. This phenomenon was pioneered by Niccolò Paganini, the famous violin virtuoso. The virtuoso piano recital became particularly popular, and often included improvisations on popular themes, and the performance of shorter compositions as well as longer works such as the sonatas of Beethoven and Mozart. One of the most prominent exponents of Beethoven was Clara Wieck, who later married Robert Schumann. The increase in travel, facilitated by rail and later by steamship, created international audiences for touring virtuosi such as Paganini, Liszt, Chopin and Thalberg. Concerts and recitals were promoted as significant events. Such was also the case with instruments other than the violin or the piano, such as the harp. The best example can be found with the popular and eccentric French composer and harpist Nicolas Bochsa who travelled most of his life giving hundreds of harp "recitals" and concerts. The music of Robert Schumann, Giacomo Meyerbeer and the young Giuseppe Verdi continued the trends. "Romanticism" was not, however, the only, or even the dominant, style of music making at the time. A post-classical style, as well as court music, still dominated concert programs. This began to change with the rise of performing institutions, along the lines of the Philharmonic Society of London founded in 1813. Such institutions often promoted regular concert seasons, a trend promoted by Felix Mendelssohn among others. Listening to music came to be accepted as a life-enhancing, almost religious, experience. Also in the 1830s and 1840s Richard Wagner produced his first successful operas. A man who described himself as a revolutionary, and who was in constant trouble with creditors and the authorities, he began gathering around him a body of like-minded musicians, including Franz Liszt, who dedicated themselves to making the "Music of the Future." Literary Romanticism and the first stage of Romanticism in music ended in 1848, with the revolutions of that year marking a turning point in the mood of Europe and its artists. As the 19th century moved into its second half, many social, political and economic changes set in motion in the post-Napoleonic period became entrenched. Railways and the electric telegraph bound the European world ever closer together. The nationalism that had been an important strain of early 19th century Romantic music became formalized by political and linguistic means. The dramatic increase in musical education brought a still wider sophisticated audience, and many composers took advantage of the greater regularity of concert life, and the greater financial and technical resources available. These changes brought an expansion in the sheer number of symphonies, concertos and "tone poems" which were composed, and the number of performances in the opera seasons in Paris, London and Italy. During this period, some composers created styles and forms associated with their national folk cultures. The notion that there were "German" and "Italian" styles had long been established in writing on music, but the late 19th century saw the rise of a nationalist Russian style (Glinka, Mussorgsky, Rimsky-Korsakov, Tchaikovsky and Borodin), and also Czech, Finnish and French nationalist styles of composition. Some composers were expressly nationalistic in their objectives, seeking to rediscover their country's national identity in the face of occupation or oppression, as did for example the Bohemians Bedřich Smetana and Antonín Dvořák, and the Finn Jean Sibelius. Young, Percy Marshall. 1967. A History of British Music. London: Benn. This article is licensed under the GNU Free Documentation License. It uses material from the Wikipedia article "Romantic music". Allthough most Wikipedia articles provide accurate information accuracy can not be guaranteed.